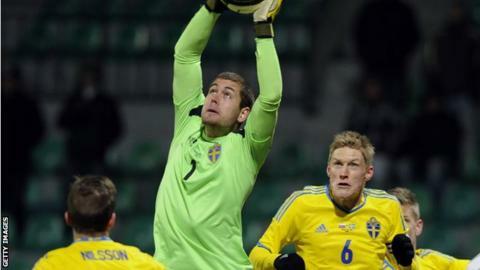 Swansea City have signed Sweden international goalkeeper Kristoffer Nordfeldt from Dutch side Heerenveen for an undisclosed fee. Nordfeldt has signed a three-year contract with the Premier League club. The 26-year-old will compete with Lukasz Fabianski for a first-team place at the Liberty Stadium, following the departures of goalkeepers Gerhard Tremmel and David Cornell. "I am really happy to be here at Swansea," Nordfeldt said. "I think this is the right step for me to take from the Dutch Eredivisie to Swansea in the Premier League. "Swansea as a club is a like a big family, and the ambitions of the club fits with my own ambitions." The Swans have also held talks with Barcelona keeper Guillermo Lara. Spaniard Lara, 18, is a product of Barca's youth system and would be signed primarily to play for Swansea's Under-21 side. Swansea have made two other signings this summer, with Ghana forward Andre Ayew joining from Marseille and French defender Franck Tabanou recruited from St-Etienne. The Welsh club are also eager to sign another striker. They are still interested in Twente's former Netherlands Under-21 forward Luc Castaignos, but have distanced themselves from reports linking them with Watford's Troy Deeney. Swansea have also dismissed speculation they are targeting Celtic defender Virgil van Dijk. Meanwhile, the Swans have arranged a pre-season friendly away against Championship side Nottingham Forest on Saturday, 25 July. Swansea face German clubs Borussia Monchengladbach and 1860 Munich on 15 July and 18 July respectively, while on 24 July they play Reading at Adams Park.